Buy New & Used Flight Jacket Online. Discover Their History. Purchase Flying Jackets and Bomber Jackets. The history of the flight jacket (also known as the flying jacket or bomber jacket in various parts of the world) dates from the First World War. However, flight jackets are descendants of the leather coats used long before motorised transport. Leather coats had been used for centuries for protection from the cold while riding horses. When the first horse-less carriages (now commonly called cars) were invented, it was natural to continue using leather as the main component of the protective clothing worn while travelling in this new form of transport. With the arrival of the aeroplane, the leather coat naturally took to the air as protection against the higher wind speeds and increased cold as the first aircraft had open cockpits (no such thing as an enclosed flight deck then). Specially designed for women, this jacket is based on the Navy flight jacket. Made in the USA for the woman of today. In 1915, Royal Flying Corps pilots were wearing long trench coats in an attempt to keep warm, such was the height that the latest fighter aircraft could climb to. These coats were rather awkward to wear while piloting the aircraft, but they were better than nothing. Soon, the US Army started designing waist-length jackets for their Air Corps pilots. These shorter jackets proved to be more practical for the pilot and started a trend which sees the descendants of those jackets in use today. The original sheepskin flying jacket was manufactured in the United Kingdom in 1926. The demand steadily increased for these jackets (which became known as leather flying jackets), especially during the Second World War with aircraft flying even higher than before. The higher they flew the colder it was. Temperatures of minus 50 degrees Celsius (minus 58 degrees Fahrenheit) were common at 25,000 feet. These sheepskin flying jackets also became known as RAF jackets. Originally the warmest leather flight jacket was the fur-lined Shearling jacket. Later versions of this jacket used wool instead of fur, which was still very warm. The B-3 Shearling jacket is probably the one that led to the term “bomber jacket”. Although the original flight jackets were leather jackets, it soon became obvious that other materials were necessary. Although the leather jacket had proved its worth for many years, it had some serious problems. As aircraft flew still higher and faster it was possible for a wet leather jacket to freeze at the new higher altitudes. The new jet aircraft were also more cramped than many original open cockpit aircraft, which meant that the older style of jacket was becoming too bulky. The end was near for the original leather bomber jackets. Two well-known American flight jackets are the A-2 (designed for the US Army Air Corps) and the G-1 (designed for the US Navy). Both jackets were incredibly successful in fulfilling the purposes for which they were designed and also went on to become symbols of adventure and honour. They created a style of their own. The G-1 jacket featured prominently in various movies including “Top Gun” and is probably the most famous navy flight jacket. Top Gun – the movie, the flying (by real Navy pilots) – the jacket – what more needs to be said? The MA-1 bomber jacket was introduced in the early 1950’s as one solution to these problems. New materials were also becoming available after the end of the Second World War including cotton twill and nylon. More recently flying jackets have also been made of nomex (a flame-resistant nylon). The latest evolution has been to become a complete flight suit. Not only have the materials changed. As technology has changed, so have the military requirements. The original flight jacket has undergone several major redesigns to become a military jacket that is used not only in the air but also on the ground around the world. 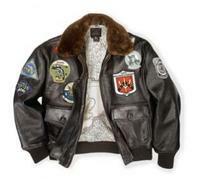 There is a wide range of flight jackets available today including men’s flight jackets and womens flight jackets. Some are still used by pilots who fly open-cockpit aircraft today, but the appeal of most flying jackets these days tends to be more fashion than anything else. Certainly they still have practical uses – with the number of pockets on them they can be very useful for carrying (and misplacing) common everyday items such as pens and keys. They are also very useful in winter to keep warm! However, the jackets made for the fashion industry do not provide the same levels of protection as those made for military or aviation use. The jackets made for the fashion industry use lighter materials which are not as resistant to damage and rough usage. The original flight jacket now has many names. However, whichever name you wish to choose, the end-use must be one of the factors in deciding which jacket to buy. Now which pocket did I put my keys in this time?